The capital of Brazil became Brasilia on 21st of April 1960. It was a new city created from scratch. It was the important achievement of the populist president Juscelino Kubitschek de Oliviera, who was in office from 1957 to 1961 (Williams 2009: 95). The city represents many identities such as a frontier city, a development project, an utopian experiment in modern urbanism, a detached center of political power and an Eldorado of opportunity. Migrants come to the city mainly for economic gain. As soon as they come across the desolate plateau, the landscape changes about 40 kilometers from the capital and they are confronted with the separation of modernist Brasilia from familiar Brazil. Brasilia starts as 14-lane speedway roars and catapults the traveler into what is hailed as the New Age of Brazil. Brasilia has become the symbol of this new age. The intention was to create not only a new city, but also a new Brazilian society (Holston 1989: 3). Although the capital of Brazil was planned well and designed as a first modern city, it did not have the impact on society that was expected. This essay will analyze the architecture of Brasília, which reflects the divisions in 1960s Brazil between socialist and capitalist roads to development. Since Brazil was mostly rural and was not changed until the mid-1930s, a modernization was needed. At the beginning of the 20th century Brazil had only a few cities and lacked the infrastructure of their equivalents in the northern hemisphere, or, over the border, in Argentina. Political power was widely spread in disconnected fazendas, which were weak and dispersed. Most of the country stayed unexplored and in terms of population distribution and orientation, the Brazil of the 1930s had altered very little from that of the sixteenth-century. The first historian of Brazil, Frei Vicente do Salvador states that it was post-colonial in name only, in fact, remaining a colonial society in function and structure (Williams 2009: 99-100). 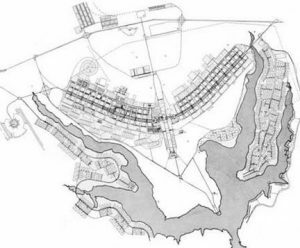 Moreover, Brazilian cities suffered from problems of transportation, housing, public utilities, and distribution and therefore Brasï¿½lia, a new, planned capital seemed to offer hope of relieving the population problems of Brazilian urban life (Epstein 1973: 9). The selection of the site was guided by three basic conditions: a central location in relation to the populated regions of the country, a location permitting easy communication with different regions of the country, and proximity to an interstate border. The most important role was to unify the country (Evenson 1973: 109). The idea and name for Brasilia actually appeared in 1789 but attained its legal form in the first Republican Constitution of 1891. The legislators argued that the move to the interior would enable the government to establish sovereignty over the entire territory of Brazil (Holston 1989: 17). Nevertheless, it took over sixty years to realize this project, intended to modernize Brazil. The entire city, which symbolizes a new future for Brazil, was an experiment built according to a plan. Brasília was a result of political will and spontaneous enthusiasm. It was not believed that a country with such a poor organization and efficiency, unable to provide adequate urban houses and services would create a new capital in an isolated wilderness (Evenson 1973: 101-102). A radical change came with the new president Juscelino Kubitschek de Oliviera, who had as his slogan: “Fifty years of Progress in Five Years” (Evenson 1973: 113). In fact, he wanted to turn Brazil into an industrial, first world nation in those five years. He also introduced the automobile industry in Brazil, which became one of the Brazils biggest and most strategically successful, serving not only an export market for Brazilian cars, but also defining the look of new urbanization (Williams 2009: 105-106). Kubitschek organized a national campaign to enlist people for the construction of Brasilia. It sought volunteers for three purposes: to build the capital, to supply the material, and to plan and administer the project. All of these people the so-called pioneers were recruited and lived at the construction site of the future capital. The recruitment campaign focused on popularizing the construction of Brasilia as the means to forge a new national identity. He made appeals through a media, which presented all aspects of the construction and inauguration of Brasilia as a pageant of Brazilian progress (Holston 1989: 206, 208). 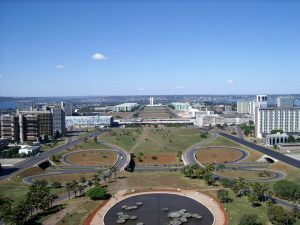 Furthermore, Brasília provided the first opportunity for an application of the principles of the Modern Movement, which had been known more for visionary projects than realized urban plans. The designers of Brasília had a unique possibility to make their urban ideals a reality; in other words Brasilia remains the greatest single opportunity have been given to an architect in our time (Evenson 1973: 118). A design competition was held in September 1956, by which time Kubitschek had already decided that his friend Oscar Niemeyer, Brazils leading modernist, would design the major public buildings. The winner was Lïcio Costa, who described his new planned city as the capital of the autostrada and the park, combining the bucolic imagery of the English new towns with that of the automotive industry (Williams 2009: 105). Brasília was also planned as the focal point of a new system of interior highways, linking the north and south Brazil providing, for the first time, a ground transportation system uniting the country from within (Evenson 1973: 102). Costa and Niemeyer viewed the stateï¿½s project to build a new capital as an opportunity to construct a city that would transform or at least strongly push the transformation, of Brazilian society-a project of social transformation without social upheaval (Holston 1989: 78). The architecture of Braslia has innovative elements representing modernization and mobility. Lucio Costas Pilot Plan for Brasília is a perfect, genuine model of the modern movement in architecture in which he incorporated historical elements, baroque perspectives, and monumental land levelings that bow to antiquity and pre-Columbian America. It made reference to both the gregariousness of Brazilian colonial times and to international urban ideas-the ceremonial acropolis, the linear city, the garden city and the urbanism of commercial areas ( Kohlsdorf, Kohlsdorf and Holanda: 2009: 47). The central area is called Pilot Plan which looks from the air like a bird, an aeroplane, a tree, or the sign of the cross, depending on whose account is read. It was designed around a motorway, the 14-kilometre Eixo Rodovirio (Highway Axis) bisected by a 5-kilometre Eixo Monumental (Monumental Axis). The Eixo Monumental surrounds the citys main icons: the National Congress, the Ministries, the National Theatre and the cathedral, all designed by Oscar Niemeyer. Progress is represented in these buildings through the modernity of their materials (concrete, glass) and certain formal innovations (such as the inverted columns). Another part of the Pilot Plan is Estao Rodoviria (central bus station), which is sometimes overlooked, literally, because in some sense it is actually subterranean. Lucio Costa did not put the government buildings at the heart of the city, instead he put a transport hub, which was the centre of both the citys public transport network and its highway network. It is a building about movement and speed, connected to the modernized Brazil that the new capital was supposed to represent. The city is conceived as fundamentally mobile; the spaces themselves are undemonstrative, flexible, designed for the rapid movement of people and vehicles. (Williams 2009: 97-99). The city became an image of the car industry, because it replaced the historicist villas of the bourgeoisie with high-rises and freeways and underpasses (Williams 2009: 106). Moreover, Brasilia is the city without street corners and crowds. The absence of the traditional streets themselves is one indication of a distinctive and radical feature of modern urban organization. In place of the street, Brasilia substitutes high-speed avenues and residential cul-de-sacs; in place of pedestrian, the automobile; and in place of the system of public spaces that streets traditionally support, the vision of a modern and messianic urbanism. It forced people to stay in their apartments and replaced the spontaneity of street encounters with the formality of home visits. This interiorization of social life had the effect of restricting and ultimately constricting Brasilias social universe (Holston 1989: 101, 107). Brasilias modernist design achieves a similar kind of defamiliarization of public and private values in both the civic and the residential realms. This means that it restructures the public life of the city by eliminating the street and also it restructures the residential areas by reducing the social spaces of the private apartment in favor of a new type of residential collectivity. This design, harmonized in plan and elevation, created a kind of a new world for the government to populate after the architects unveiled the built city. As one migrant explained about her experiences in this newly inaugurated world: “Everything in Brasilia was different. It was a shock, an illusion, because you did not understand where people lived, or shopped, or worked, or socialized” (Holston 1989: 187). The absence of an urban crowd has earned the reputation of a city that lacks human warmth (Holston 1989: 105). Although the plan offered a solution to social stratification, many deviations appeared in the settlement and social life from the original plan. Brazilian architects were inspired by Soviet constructivism and post-Stalinist functionalism that provided more than just examples of specific architectural solutions for the Brazilians. They also provided the model of social architecture in the solution of collective problem (Holston1989: 38). The residential sectors are differentiated into four subtypes, each associated with a different form of housing, but all ultimately related in their planning to a concept of zoned, collective dwelling. Sectors of Collective Dwelling are those that consist exclusively of apartment blocks that share residential facilities and are arranged in groups within green area of public land. They are found predominantly in the Pilot Plan, where the apartment blocks are organized into units called superquadras, in which all families have the same life and rights. Costas superquadra derives directly from the Soviet Constructivist prototype for collective residence, the dom-kommuna. The planned residential unit is a self-sufficient community providing a full-range of collective services for its residents (schools, day-care centers, kitchens, clinics, shops) and that of a unit linked with similar units into a larger community (Holston 1989: 163-165). However, after completing the city, many deviations appeared in the urban settlement pattern and social life from the original plan. One of the most important deviations is that the majority of people live in different parts of the city than was originally planned and many places remain empty. There are four major areas of settlement in Brasï¿½lia such as the central planned area Pilot Plan, the satellite towns, which are recognized as permanent and legal by the government and construction camps operated by private companies, but are considered temporary. Likewise in other Brazilian cities squatter settlements have been developed in Brasï¿½lia, because for some people that was the only possibility. The largest squatter settlement is the Social Security Invasion, which was the opposite of the Pilot Plan and had a profound effect on evolution of the city (Epstein1973: 10). The differences can be seen immediately. In the Social Security Invasion there are no paved streets, people live in wooden shacks and have no electricity and no drinking water, whereas Pilot Plan streets are paved in asphalt, houses are made of glass or cement, people have their own cars and can shop in hygienic supermarkets (Epstein1973: 106). This reproduces the distinction between privileged centre and disprivileged periphery that is one of the most basic features of the rest of urban Brazil, of the underdevelopment Brasils planners reject to deny in building their new world. The paradox of Brasilias development is not that its radical premises failed to produce something new, but rather, that what they did produce contradicted what was intended (Holston 1989: 23, 28). The city, which is one of the largest construction projects in human history, caused positive and negative reactions. For some people it symbolizes a break from the agrarian past and the life of the coastal centers into a future of pioneering growth in the interior and in the realm of industrial production, whereas for others it represented only a monumental urbanistic and social disaster, a venture into conspicuous consumption and the source of crippling inflation (Epstein 1973: 26). Besides, the first generation of migrants in postinaugural Brasilia called its impact as a brasilite, meaning Brasil(ia)-it. It is an ambiguous description, because it includes negative and positive responses to the planned city. It refers to peoples feelings about daily life without pleasures and little rituals-of the outdoor public life of other Brazilian cities. On the one hand, Brasilienses appreciated the economic opportunity and higher standard of living. In the 1980 census confirms Braslia’s preeminent position in Brazil as a place to work. The urban conditions and job opportunities provided in the city itself-called the Plano Piloto are very good so the quality of life in these terms is exceptional. On the other hand, the negative aspects of brasilite are linked to a negation of the familiar urban Brazil in the citys organization and architecture. The mixing of social classes in the same superquadras was seen as explosive, igniting conflicts among neighbors of different life styles and values. The uniform fades were considered monotonous and their standardization produced anonymity, not equality. People also complained about familiar style missing streets and the crowds that they had enjoyed in other cities. They found the street life “cold”. As a result they tried to familiarize this utopian city by putting their shops back on the street, in contact with curbs and traffic. Many bureaucrats moved out of the center, preferring to build individual houses that show off the residents wealth, status and negate the modernist aesthetic. According to peoples evaluation Braslia is quite seductive and its practical advantages come to outweigh its defamiliarizations, but what resulted was not of course the old Brazil, but neither was it the imagined city (Holston 1989: 24-25). To conclude, Brasilia was conceived as a model city, a constructed image, not of existing Brazilian conditions, but of the future of Brazil. It was also a critical utopia as an image of a future radically different from the present. Brasiliaïs planners called it the capital of the twenty-first century not because they thought its design futuristic in any phantasmagoric sense. It represented for them a set of solutions to immediate development objectives that constituted a blueprint of how to get to a possible future (Holston 1989: 84-85). Brasilia is not exactly a human settlement surrounded by its history; it might indeed actually appear as unimaginative and inhumane aspects of modern civic design. According to the Italian critic Bruno Zevi, “It is a city of Kafka”. Brasïlia presents the vision of a totally man-made environment. Although it was critized in the past, its physical image with its wide roads, uniformly modern buildings, vast monument axis, and dramatic government complex, has become as well-known known a symbol of Brazil as the statue of Christ on Corcovado (Evenson 1973: 103-104). Urban Development (London: University of California Press). Janiero and Brasília (London: Yale University Press). (London: The University of Chicago Press). Kohlsdorf, Mara E; Kohlsdorf, Gunter; Holanda, Frederico (2009), Brasília: Permanence and Transformations in Contemporary Urbanism in Brazil: Beyond Brasilia, ed. Vicente del Rio and William Siembieda (Florida: The University Press) pp. 42-64. Williams, Richard J (2009), Brazil, (London: Reaktion Books).